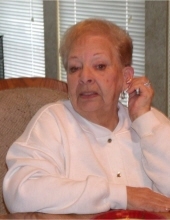 Dorothy L. Dethlefsen, 82, beloved wife of the late Russell; cherished mother of Cheryl (James) Falada and Susan (Al) Cimino; dearest grammy of Brian, Sam, Lou and Max (Shannon); dear sister of William Rabe and the late Barbara (late Robert) Damiani; fond sister in law of Carole (Ron) Hosler. Visitation Thursday, April 4, 2019, 2 to 8:00 p.m. and Friday, April 5, 9:00 a.m. till time of services at 10:00a.m. at Ivins/Moravecek Funeral Home 80 E. Burlington St. Riverside. Interment Mt. Emblem Cemetery. To send flowers or a remembrance gift to the family of Dorothy L. Dethlefsen, please visit our Tribute Store. "Email Address" would like to share the life celebration of Dorothy L. Dethlefsen. Click on the "link" to go to share a favorite memory or leave a condolence message for the family.